With autumn in its full swing, this week we’ve got something to warm you up and sweeten your mood. Our inspiration came from our succulent figs, one of our products of the month. These wonderful figs are carefully selected and hand picked. Then they are dried naturally under the Greek sun, with no additives or preservatives. The figs are harvested from the fertile Messinia region in the Peloponnese, which we love. Searching for recipe ideas with dried figs we decided to go for something we haven’t tried before. A compote. The idea came from our vegan stuffing recipe with raisins. While cooking up the recipe, the raisins soaked up all the juices and got rehydrated. What would happen to our figs in a similar situation? Let’s see, shall we? For this recipe here we did not use any sugar. Just a combination of spices and fig molasses! It is dried figs that we want to liven up, what better pairing than fig molasses? In full disclosure, we had some leftover from our summer granola and dressing recipe. And there’s nothing more this writer loves most than no-waste cooking. And speaking of no-waste cooking have a look at our cooking class this November. We will learn a lot about no-waste there too! Place all your ingredients in a medium-sized pot over medium-high heat. As soon as bubbles start to form, turn down the heat and cook on low for 30-40min, until the figs are tender and the liquid has caramelized. Fig compote is great served warm, as is or over Greek yogurt. 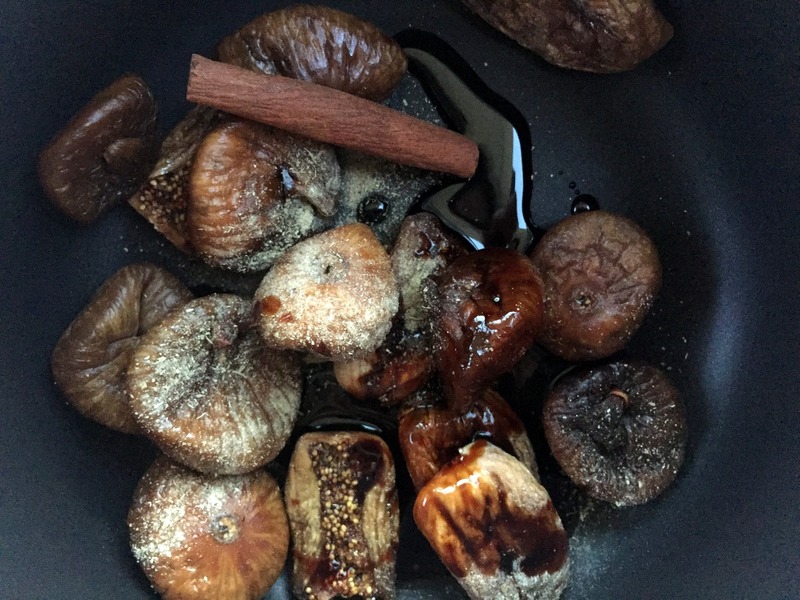 This entry was posted in Recipes and tagged dried figs, fig molasses.